I was hoping for better to be honest, but my new year didn’t get off to a great start. It was the very early hours of new years day when it happened, and it has caused me much pain and distress ever since. I had been in such a great mood, after a quiet new years eve, just chilling, with Wendy and the girls, we had played a daft game, had a laugh and performed the obligatory ‘Old man’s eye’ as it’s known in our house (or Auld Lang Syne, to the rest of the world….before you ask, it’s a long story!) and I decided in my wisdom to pop downstairs for a drink. Now before you go jumping to conclusions, it wasn’t a drop of the strong stuff, because I never go near it, it’s more likely to have been a Diet Coke. Well, I opened the kitchen door and as the lights were off and the switch is across the other side of the room, I paused for a moment to check that the 3 dogs were all tucked up in their bed. I wouldn’t want to be tripping up over any of them and doing them and more importantly me any injury and thankfully they were all snoozing soundly. I closed the door behind me and strode confidently into the darkness. I hadn’t taken more than 4 steps when my bare foot stumbled across an obstacle upon the floor. I had no warning at all and as I leapt into the air, yelling uncontrollably, ultimately collapsing heavily like the proverbial sack of spuds, I immediately knew what it was that I’d stepped on. You see, Wendy had spent hours pre Christmas, searching for just the right gifts for all of the family, including Scout, Elsa and Boo, the dogs. Well, one of these gifts, was a meat scented, pork or maybe lamb chop, which by new year had received several hours of chew time and was somewhat misshapen, with lots of sharp protruding edges, several of which were now impaled into my right foot. As you can imagine, I wasn’t best pleased at all and you will not be surprised to note that not one person attended the scene of the accident, to seek after my welfare, but I have a long memory ladies, let me tell you! For those people who may be interested, after an extremely close run, 3 way weight loss challenge, the final standings were announced on Christmas Day. In 3rd place was my Mother, who had fought valiantly, but had succumbed to the temptation, in 2nd place was myself, who I still think was diddled out of winning, due to being ganged up on by the women folk offering too many tasty treats. Which leaves 1st place being taken by Olivia, who I may say is welcome to the £200 winnings, because anyone who can motivate themselves to get out running, across the fields, in the dead of night, in freezing temperatures, deserves it! During Christmas week, we decided that we would move ‘Mac’ our tup to pastures new. So, one chilly morning, Wendy and I cracked on and shifted him. 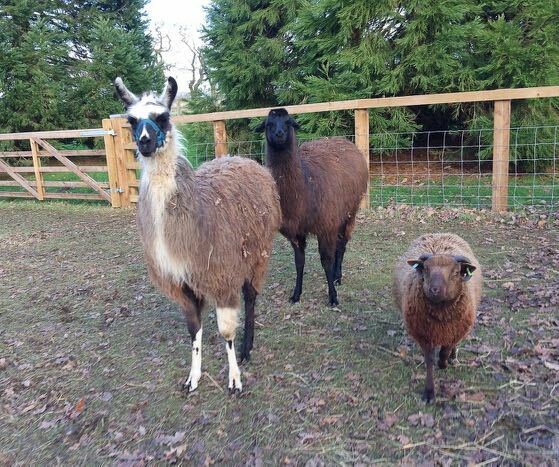 He was clearly excited to get in there and discover what was in store, that was until his new house mates, Marguerita and Miguel the Llamas came lolloping across the paddock towards him. He was running for his life round the field, with his tail between his legs and all they wanted was to say hello. All is now well, the bottom sniffing has ceased and they are all friends.